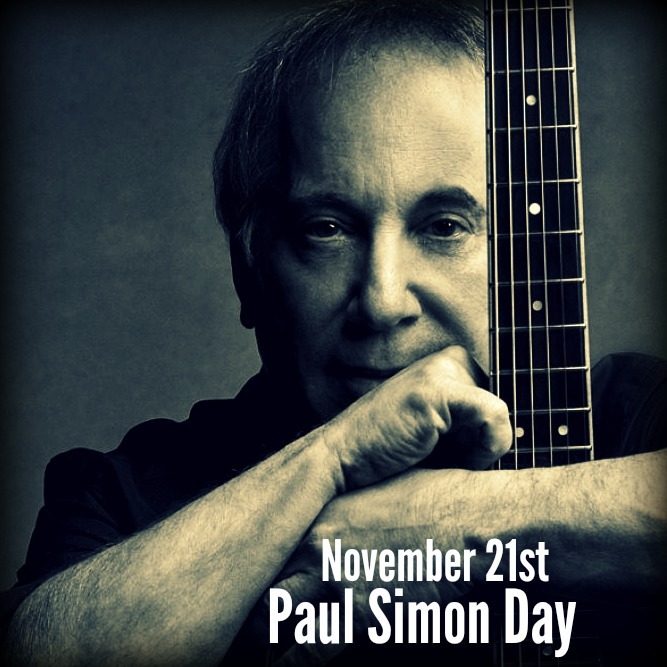 November 21st, Paul Simon Day! BEHOLD! I hereby declare November 21st to be Paul Simon Day! He has sung to me for like my whole freakin’ life, a blessing and a bardly companion through the years. I’m feeling super grateful this morning for all he has sung into my life over the years, from the melancholy strains of Sound of Silence to the dancing joy of Graceland. One of my earliest cassette tapes was Simon and Garfunkel’s Greatest Hits, and it’s in my iTunes library today with others. My all-time hands-down no-contest favorite song from Paul Simon? It harkens back to the good ole’ Simon and Garfunkel days… The Dangling Conversation. Simply some of the best lyricism on the planet. I don’t know for sure that Paul needs a day, but now he has one. I’m holding out hope that we’ll still meet up one morning (with all the other hipster wildebeests) at Starbucks and lead everyone munching on their Cranberry Bliss Bars in a rousing chorus of Bridge Over Troubled Waters, because you know, I’ll just happen to have a ukulele with me. We all need a dream right? Happy Paul Simon Day, beloved! Happy Paul Simon Day, Paul! This entry was posted in Just Life, Poetry and tagged lyricism, November 21, Paul Simon, Paul Simon Day.